Never Hire a Sales Dud Again! Let this #1 consultant and “Dell #1 instructor” show YOU how predictable, affordable, and simple it can be to hire sales superstars that make you money FAST with a process that weeds out professional interviewers and identifies real producers! How would you like to join the HUNDREDS of other sales managers around the world who are now hiring with less drama, reducing their recruiting costs, talking to fewer duds … and reducing their sales staff turnover, increasing per salesperson sales and increasing their company’s profitability faster than they ever thought possible? The solution for serious managers tired of the hiring roller coaster, inconsistent sales staff, headaches and lack of production their current hiring processes may be causing. My team and I feel we have developed is a hiring process that allows managers in any industry to hire top-performing sales people for less money – both on advertising and in base pay – faster, with less stress, more confidence, more clarity, and with greater accuracy … consistently, repeatedly, and confidently! No matter what your age, size of your company, industry, or hiring skills may be right now, you CAN become a better attractor of top sales talent. As Founder, President & CEO of The Sales Whisperer®, Wes has worked with sales professionals and entrepreneurs of all levels – from sole practitioners to Realtors® to Inc. 500 private firms like Infusionsoft® to Fortune 50 firms such as Dell. Why do so many people come to Wes for help … and why do his students and clients absolutely rave about him and his methods? Because he helps them get the results they desperately want and need! And what he’s done for THEIR businesses, he can now do for YOU. 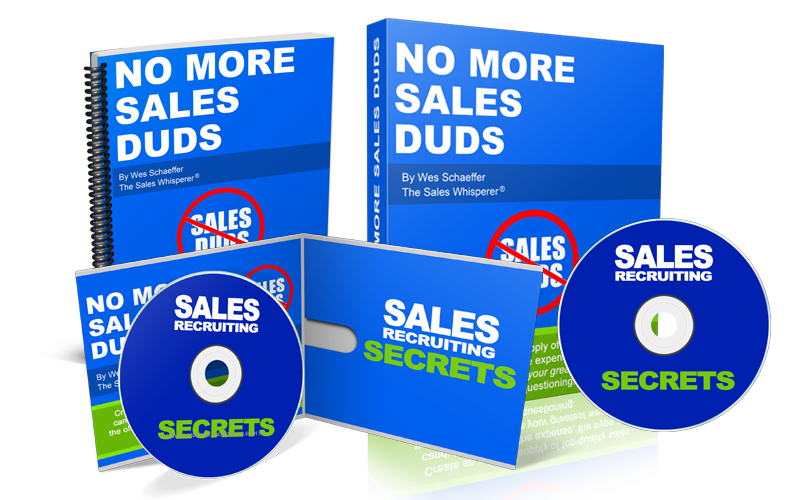 …because in an effort to reach out and help even more of those business owners, entrepreneurs and sales managers who could benefit most from his teachings, Wes introduces you to…No More Sales Duds, Wes Schaeffer’s Signature Series. The No More Sales Duds program shows motivated sales managers how to set the tone with motivated sales candidates to cut through the hype and the B.S. and the “creative writing” of the typical resume floating around the internet today. The goal of this direct process from the wording of the ad, to the scheduling of the interview, to the questions asked in the interview, to the time allotted is keeping you in control of the process that is affordable, and easy to repeat again and again. Yet it does so in a way that’s surprisingly quick and easy to get the hang of. In fact, you will see and feel the difference the very first time you use it. 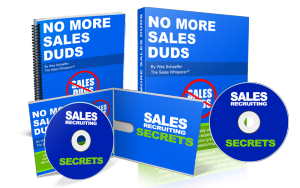 The No More Sales Duds process is packed with power, control, consistency, and “tone-settng-friendliness” … all in one easy-to-understand method! Don’t go blaming it all on “the economy” or “the poor work ethic of this generation”. And don’t go buying into that commonly-held myth that a certain amount of churn and having to meet with “lumps of coal to find the diamonds” is simply “part of the game” either. The No More Sales Duds program can dramatically reduce sales staff hiring and onboarding-related pain. HIS… is not a complicated system. In fact, it’s about as simple as it gets. Look, I want you spending your time golfing and dining with happy clients, not frustrated like a sales manager having to act like Dr. Phil, Oprah, Jerry Springer and Dr. Laura all before lunch.